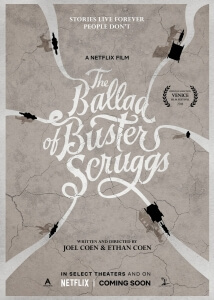 The Coen Brothers have made no secret of their adoration as of late for the old Hollywood Western, with their highly successful take on True Grit winning over audiences and awards bodies, and their most recent homage to the genre as part of their overall love letter to old-school filmmaking in Hail, Caesar!, but The Ballad of Buster Scruggs is the first time that either Joel or Ethan Coen have been able to tackle all the beloved sub-genres of the Western all at once. Originally developed as a six-part Netflix miniseries, their project was eventually retooled into one feature-length set of tales set in the Old West, and in doing so they have been able to showcase their clear passion for the Western genre all in one fell swoop, whilst always staying true to their trademark black comedy and odd, even surreal, drama that they have become known for. The way this review is going to work is that each of the six stories are going to be discussed in their own separate paragraphs, after which an overall analysis will then be revealed – that way, each of these stories gets the same amount of attention, just as the Coens intended them to be. Our first story is The Ballad of Buster Scruggs, which introduces us to the white-suited, happy-go-lucky singing cowboy of the title (Tim Blake Nelson) as he sings – and shoots – his way across the Wild West. This segment is by far the most fun, with Nelson carrying the whole thing with a charismatic and optimistic glee that’s just irresistible, even when he’s engaging in surprisingly violent shoot-outs during which he barely ever drops his wide smile. At times, with its multiple medleys, it feels almost like a mini-musical, calling back to Westerns from the 1940s that offered a more romanticised vision of the Old West where standoffs are a way of life and the saloons were filled with characters who could burst into song at any given moment. In that regard, I enjoyed this segment immensely, but even more so when the Coens inject into it the type of dark comedy that only they can pull off; there is a death in this section involving a tense poker game that is probably the hardest that I’ve (intentionally) laughed at an on-screen demise all year, and the way that it wraps up is pure Coen Brothers in all of its strangeness and oddly cartoonish manner. I kind of wish it was longer because I was having so much fun, but sadly we had to move on to newer things. That newer thing being the second story, titled Near Algodones, in which a bank robber (James Franco) attempts to steal from a teller (Stephen Root) but ends up going on a mini-odyssey that includes, among a few other things, an attack by a Native American tribe. The shortest segment of the lot at approximately 12 minutes, this one feels like a shortened homage to Sergio Leone Westerns, right down to some of the cinematography that goes close-up on Franco’s face at times; however, this is one of the few stories here that feels ultimately rather pointless, which I assume was the intention – because in the past the Coens have thrived on telling stories amounting to nothing – but there is a fundamental difference between telling a minor story with little to no meaning, and just wandering aimlessly without an idea of where to end up. Try as it does, including some strong cinematography and the occasional dash of dark visual humour, this segment was a bit too aimless for its own good. The next story, Meal Ticket, luckily had more of a focus, but is a hell of a lot more depressing. It sees Liam Neeson as an impresario who travels to town after town with his main act, a young British man named Harrison (Harry Melling) who has no arms or legs and delivers dramatic readings of poems, Bible verses, Shakespearian monologues, and Abraham Lincoln’s Gettysburg Address to crowds of various – but slowly shrinking – sizes. The tragedy of this story lies in the central relationship between Neeson and Melling’s characters, as although the former is shown to tend to every one of the young man’s needs such as feeding him and helping him to urinate, he is a man driven by his own selfish desires and a sense of greed that sees him milk the talent of his young protégé for all its worth, ultimately leading to a decision so cruel and callous it makes the whole thing feel even more uncomfortable (just wait until you see what Neeson has his eyes on next as a potential replacement act, just to add salt to the wound). Both Neeson and Melling are great in this, as they both convey their respective characters’ tragic nature with very little dialogue, ultimately adding to the overall tragedy that this story heavily inflicts upon the audience. It is a dark tale, but told with such beautiful and understated performances that the darkness suddenly becomes a little more bearable. Next, All Gold Canyon sees an elderly prospector (Tom Waits) arrive in a remote mountain valley where he begins digging for gold by the luscious stream. This segment is essentially a one-man show for most of its running time, with Waits channelling his inner Nick Nolte in both his appearance and how garbled some of his dialogue can sound, but nonetheless excelling as a man driven by a simple passion that’s hard not to admire. As he gets closer and closer to striking gold, you kind of want this guy to find what he’s searching for because he’s not a morally bad person, just a guy who’s there to do his job and keep himself company as he’s doing it; whether or not he actually succeeds would obviously be a spoiler, but even if you figure out where it’s going, there’s no way you’re going to deduce how it’s going to get there, and like most of the other segments in this anthology it will both shock you and have you feeling all other sorts of emotions as it happens. After that, we come to The Gal Who Got Rattled, which sees a young woman named Alice Longabough (Zoe Kazan) travel with her meek older brother Gilbert (Jefferson Mays) on a wagon train towards Oregon, only to soon be left alone when he suddenly succumbs to cholera, and in the company of the wagon train’s kindly leader Billy Knapp (Bill Heck) who takes a shine to her. This is the longest segment of the bunch, at approximately 38 minutes, but unfortunately it’s also the one I liked the least; the lengthened running time certainly gives it a more epic feel than some of the other stories, but a majority of the characters are ill-defined and not written interestingly enough to truly care about what’s happening. Kazan, as the titular Gal, feels especially underutilised in a story named after her very character, acting more as an observer than a fully-rounded character in her own right, and falling more into the background whilst others take the reins in her stead. There is a well-choreographed battle scene towards the end, when characters encounter a Native American tribe (only the second of two such tribes in the whole movie), but I didn’t find myself caring much for what was going on or who it was happening to, and that is a fundamental flaw when so many of the other segments feel so much more driven by character. Speaking of which, the final segment – titled The Mortal Remains – does exactly that; we focus almost entirely on a group of passengers on board a sunset-drenched stagecoach towards a certain destination, two of them a couple of bounty hunters (Brendan Gleeson and Jonjo O’Neill), a fur trapper (Chelcie Ross), a Frenchman (Saul Rubinek), and a God-fearing lady (Tyne Daly), who all engage in increasingly heated conversation with each other about a variety of subjects, all the while dropping hints about the very destination they’re heading towards. You certainly pick up hints along the way, many of them glaringly obvious, but the point of the story is not necessarily the destination, but the journey in which these characters all slowly come to certain realisations that they may all be there for a specific reason. As you hear these characters talk for paragraphs about relations with women and theories on love and how people are only either good or bad, the more you’re drawn in to the lives they must all lead, and how (if at all) they will go on being the same afterwards. It’s a slightly surreal story to bow out on, but it’s still a very well-written and performed oddity that overcomes its slightly pretentious conclusion. Overall, the Coen Brothers have created a series of stories that homage the Western genre in its many forms, from the big overblown musical to the Sergio Leone tension-builders to the quieter mood pieces to the epics to the outwardly surreal. They are all, as to be expected by esteemed filmmakers such as Joel and Ethan Coen, extremely well-made from the luscious cinematography by Bruno Delbonnel to the warm and playful score by Carter Burwell, and are especially admirable when you can clearly see the passion behind them as they make each and every one of them come to life. Like most Coen Brothers movies, it will probably divide some viewers, but as another thrilling – if not entirely perfect – new entry into their filmography, it’s a ballad you won’t mind singing along to. The Ballad of Buster Scruggs sees the Coen Brothers pay homage to several types of Westerns in six separate stories, all of which are directed, written, acted and shot with great passion, and even though not every story works, the sheer love these filmmakers have to this genre is undeniable and on full display at all times.